September 9th, 2016 How Does Toronto's Fintech Sector Rank Globally? Investment numbers and market size are rather hard to find for Toronto's Fintech sector and without knowing the methodology it would be hard to come up with comparable figures. But employment is relatively clear and there are numbers for it. The only issue with comparing Toronto employment to other jurisdictions is that different people have different definitions of Fintech. Fortunately the UK report used a fairly broad definition so the figures available for Toronto should be pretty comparable. Fintech employment in Toronto is probably around 20,000 - 60,000 employees. The City of Toronto's "Invest Toronto" initiative recently estimated Fintech sector employment in Toronto at 23,000 jobs (out of 168,000 technology-related jobs). D+H on its own has 954 employees in Toronto according to LinkedIn. The Toronto-based Fintech company has over 5500 employees worldwide. The Toronto Financial Services Alliance (Bay. St. trade association) estimates Fintech sector employment in the Toronto region at 60,000 employees. Toronto's Fintech employment probably puts it at around 4th place globally, behind the state of California. Toronto's Fintech employment is likely just behind New York's (which EY reports as being around 57,000 people). 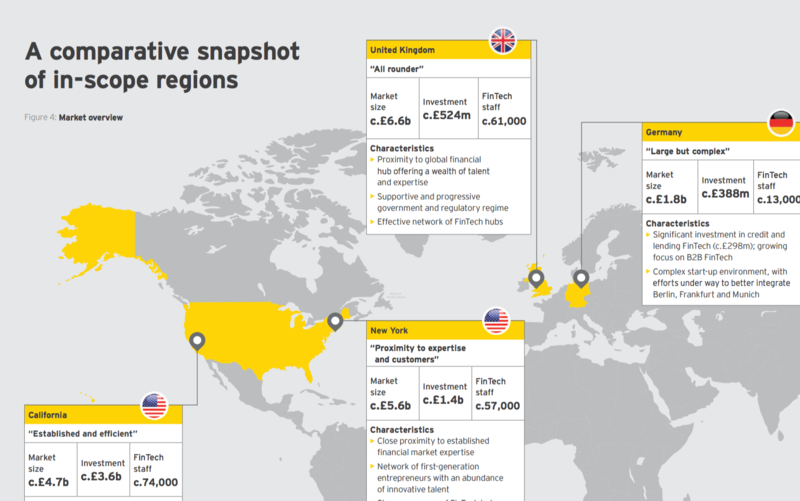 Note that the EY report a range of jurisdiction types: cities, regions and countries. I've requested information about the methodology report from the EY report authors and will update this blog post when/if I hear back.